Top: At the top, three domes are placed with floral desing and carving. The front side of the temple is covered by the Mehraab with pillar designa and mehraab consist of peacock design. Garbgriha: The center consit of two pillars with elephant carved at base in saluting and Peacock design at the top. The back is made up of teak ply and beautifully deigned with two half pillars at the back and same at the ends. The sides of the temple are enclosed with the jaali desing / net design. The center area provides you the ample space to place your deity. 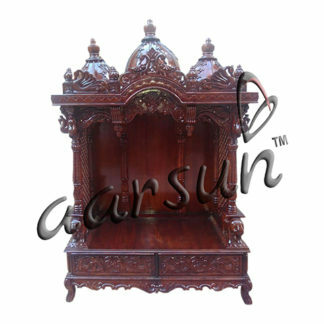 Base: The base contain two full length drawer with carving matching the overall design to keep pooja essentials with a handcrafted panel in similar design as Mehraab-peacock at the base of the temple. The entire temple is supported by 4 legs.